ULSTER DAVIS—A master mariner and pilot, whose personal career has been intimately bound up with the course of river navigation in the Eastern States during the past thirty-five years, Mr. Davis maintains a fleet of ten vessels in the river trade. He was born in Kingston, Ulster county. New York, March 3, 1867, son of James E. and Adelaide (Dunn) Davis. His father was a native of Ulster county and lived there until his death in 1897. Mr. Davis' mother died when he was only thirteen years old, but the careful training she gave him in his childhood and the homely virtues she taught him by precept and example have remained with him throughout his long career and are responsible to a great extent for his present success. Mr. Davis received his education in the public schools, completing the full course of instruction at the early age of thirteen. Anxious to succeed and to make a place for himself in the business life of the county, he lost no time in beginning to work but accepted a position with his father, who was at that time the proprietor of an express business. Mr. Davis accordingly spent the next three years as the driver of a truck for his father, but the work proved too heavy for a lad of his years and atthe end of this period he gave it up in order to seek more suitable employment elsewhere. He had no difficulty in finding a position as a worker at the dry dock at New Baltimore. While engaged in this work he became acquainted with Robert H. Zandt, whose daughter, Eugenia, became his wife in 1885, and the acquaintance rapidly developed into a lasting friendship, which was strengthened later by the family relationship created by Mr. Davis' marriage. Before long he entered into partnership with his father-in-law, becoming captain of a steamboat on the Schuyler line. In this partnership Mr. Davis found what was destined to be his life work. The charm and fascination of river navigation laid hold upon his imagination and he found the work increasingly interesting. He was a born sailor and made rapid progress in the art of seamanship, learning the lights and channels of the Hudson and its tributaries, and becoming a master of every phase of a ship's work and life. He remained with his father-in-law from 1887 until 1903, serving as captain of the tug "Saratoga," making innumerable voyages up and down the river which he had come to know so well. Becoming a captain in this manner at the remarkably early age of twenty years, Mr. Davis made good use of the knowledge acquired in the days of his employment at the dry dock at New Baltimore and as a sailor on the Schuyler line before his entrance into partnership with his father-in-law, and during all the long years of his sailing life, he has shown himself to be a master of the nautical art, a man of courage and resourcefulness, and skilled in business management no less than in navigation. In 1903 when he left his father-in-law, Mr. Davis organized the Albany Towing Company, of which he became president and general manager. This venture proved to be an immediate success. In those days, when a great deal of freight was transported by canal and river service, there was a constant demand for towing service and Mr. Davis, who had a wide reputation as a captain and pilot, had frequently to enlarge his facilities in order to keep pace with the commissions entrusted to him. He continued to direct the affairs of the Albany Towing Company until 1913, when he decided to accept an advantageous offer and sold the business to the Cornell Steamboat Company. 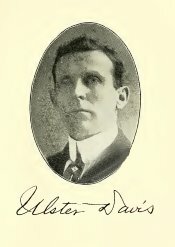 Taking his capital and the profits of his sale of the Albany Towing Company, Mr. Davis then established himself at Rensselaer, as the proprietor of the Ulster Davis Individual, and his business has grown steadily since its foundation. At the present time he operates a fleet of ten vessels and is known on all the major inland waterways of the East. He holds a master's license to navigate ships of unlimited tonnage on the Hudson river, the Housatonic river, the Connecticut river, and in the waters of Lake Champlain. His skill and ability as a pilot is known in shipping circles throughout the East, and he has often successfully piloted ships up the Hudson river when other pilots had given up the task as hopeless. An authority on navigation, Mr. Davis takes a great interest in the maintenance and preservation of American navigable streams and watercourses. He believes in the expansion of the canal system and is an advocate of the advantages of transporting freight by water. He also believes in the establishment and maintenance of a powerful merchant marine for America, which shall once more carry the flag to all ports of the world and restore the prestige enjoyed by the United States as a maritime power in the days of the famous clipper ships. Not less important than the maintenance of the merchant marine is the support of the navy, and Mr. Davis is a believer in naval preparedness, taking an especial interestin the peacetime work of the navy. Among the many vital interests of sailors and maritime business men, is the maintenance of adequate lighthouses and buoys in dangerous localities. Mr. Davis is keenly interested in the development of modern inventions designed to safeguard the lives of sailors and to prevent the loss of valuable ships and cargoes, no less in lakes and on rivers than along the open sea. He knows all the lights in his own territory and takes an interest in many famous ones which, although not known to him personally, are yet the pride of every American who understands the hazards of their construction and upkeep. As a distinguished captain and pilot, Mr. Davis is a member of the National Organization of Masters, Mates and Pilots of America, of which he serves as national trustee. In politics Mr. Davis is a staunch supporter of Democratic principles. He was formerly a member of the school board of Rensselaer, and has always taken a great interest in the public school system, believing that every child is entitled to a sound vocational training as well as to a purely cultural or business education. He is a member of the Albany Club of Downtown Businessmen, and belongs to the Albany Lodge, No. 49, of the Benevolent and Protective Order of Elks. He is a Mason, and holds membership in Greenbush Lodge, No. 337, Free and Accepted Masons; and of Chapter No. 274, Royal Arch Masons, of Rensselaer. Mr. Davis married, at New Baltimore, on June 7, 1885, Eugenia Zandt, daughter of Robert H. and Julia Zandt. Mr, and Mrs. Davis had three children: Robert, who was named for his mother's father; Royal, who died in infancy; and Laura, who was born at Rensselaer.